When we think of tile cutting tasks, ceramic tiles spring to mind – they are, after all, the industry standard. On the other hand, there is a glass, laminate and porcelain tile as well, and this power tool version comes equipped to handle them all. 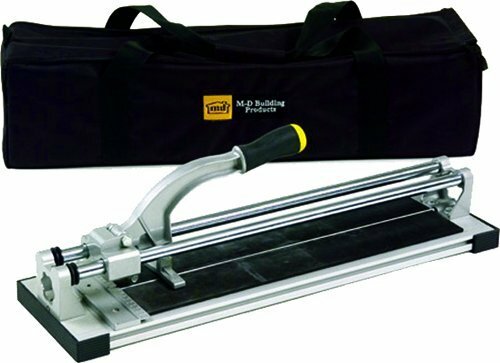 The best tile cutter tool of choice is one that can work with these materials and perform neat slices or shaping as required. Whether they take the form of attachments that go onto regular power tools or manual versions, ceramic tile cutters should be able to work efficiently and reliably, both vertically and horizontally. Their functionality is simple: using hardened metal wheels, tile cutters create lines on tile surfaces that, under the right pressure, can be snapped off, therefore reshaping the original tile. More often than not, your aim will not be to break or hammer existing series of tiles in a residence, warehouse, or workplace but to alter them – for aesthetic, practical, or remodeling purposes. In these cases, a ceramic or glass tile cutter can make all the difference. There are two types of cutting styles: dry and wet. Opinions vary as to which one is more ideal, and this boils down to the type of tile you are working with. For instance, porcelain gres tiles are small and measure 30x30cm and have an average 7mm thickness. With porcelain and glass mosaics, on the other hand, you are looking at 2x2cm tile work. In these, a quality tile cutter can work artistic marvels in a short period of time. Another sub-category of tile cutter that professionals rely on is a multifunctional model that can handle larger porcelain tiles measuring 40x40cm with thicknesses in the 7 to 12mm range. As you can imagine, there is simply no general power tool out there to perform tile cutting to the specific market requirements placed on such tasks today. 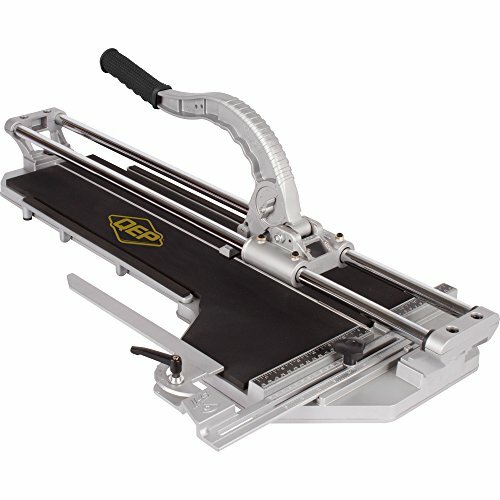 Known for its strength and functionality, the Brutus 10600BRis designed to serve as a multi-purpose tile cutter, and can handle both porcelain and ceramic tiles (floor and wall).Ishii engineering has ensured that the user can perform 24-inch cuts using this model – you can take it 18 inches diagonally. Rubber padded aluminum alloy comprises the base (high strength consistency). This design feature imparts remarkable stability to the cutter. Linear ball bearing slideshelp you perform quick scorings, to say nothing of the smooth-flow advantages of the chrome-plated rail bars. Playing the role of cutting wheel is a tungsten carbide titanium-coatedblade (7/8 inches)– this feature confirms one of our own guesstimates, namely that it imparts good performance and durability to the Brutus 10600BR. Depending on what type of depth and cut you aim to achieve, you can work with four different height adjustment options. Thanks to this, snapping techniques are not that hard to accomplish. The handle’s bicycle grip design promotes ergonomics and fatigue-resistant control. A side arm extension is also incorporated into the design to help with cutting larger tiles. Weighing in at 18.6 pounds, this tile cutter is as portable as it is efficient. Can cut 1x1 pieces without resulting in cracking or chipping. Handles porcelain as well as ceramic tiles. Base made of reliable rubber-padded aluminum alloy. Chrome-plated rail bars for improved smoothness. The cutting wheel is made of titanium-coatedtungsten carbide. Capability: regular 24-inch cuts, 18-inch diagonal cuts. Works wonderfully with large format tiles. Ruler portion on the cutter’s side is not reliable; reported to break off. Will not rip cut 6×24 inch tiles; a wet saw is better for this. Styled after the guillotine, the Roberts 10-64 has 13-inch blades that can be replaced or sharpened separately. A sturdy plastic surface and extruded aluminum base ensure remarkable stability for the whole ensemble during operations. Vinyl siding and flooring, laminates, foam or rubber tiles, VCT tiles, and engineered wood all come under the 10-64’s capability range. There is also an extended handle to grant you more leverage, especially when you desire an added dash of cutting power. The handle lets you do this without expending unnecessary effort. 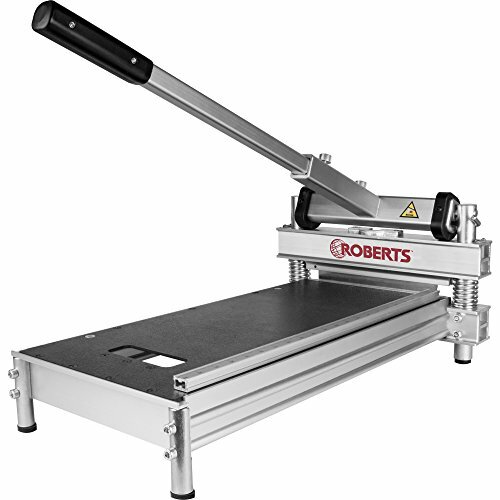 Tile measures that the Roberts 10-64 can handle are 13-inch wide 5/8-inch thick pieces. You can produce clean well-cut edges on several different varieties of flooring materials. The cutting guide is designed for heightened efficiency, meaning it can swivel and lock itself into place so that you can perform precise angle cuts. Being fully adjustable means you can use the 10-64 to produce perfectly square cuts even after years of use. Weighing 23.8 pounds, this reasonably heavy tile cutter comes designed to save you plenty of project-related time constraints if used correctly. For example, if you wish to install 3500 square feet of laminate, you merely need to put the material on the cut-mark, hold it in place with a knee, and pull the lever to max extension. While the 10-64 can certainly cut fiber cement siding, do not be surprised to learn that you will need to sharpen the blade often for this task. The previous model, the Roberts 10-63, is essentially a DIY model and not as reliable or sturdy as the 10-64. Capability: 13-inch wide 5/8-inch thick pieces. Material range: vinyl siding and flooring, laminates, foam or rubber tiles, VCT tiles, and engineered wood. Sturdy plastic surface at base. Little noise and dust accumulation levels during operation. Reduced workload for laminate engineered installers. The deck could have been tougher. The tougher the material being cut, the sooner the blades will need replacing. While it is great with laminates, it is not as efficient where real wood flooring is concerned. Side support has a tendency to break. At 17.2 pounds, this is one of the more lightweight models on the market.The extruded aluminum base is designed to withstand heavy-duty pressure, and will not easily crack. Chromed steel rails ensure smooth and straight cuts. You can readily cut 20-inch tiles with this noteworthy model, particularly square tiles with 5/8-inch thickness. You can experience smooth and hassle-free operation, thanks to a ball-bearing carriage. In case you are wondering, it cannot cut marble because the stone has a grain pattern on its surface that prevents precise cuts with the M-D 49047. If you are having difficulty cutting 1.75 inches into an 18x18 inch porcelain tile, simply create a couple of surface scores and it will cut smoothly. Failing that, use a tile saw. The M-D 49047 is exceptionally faster than a wet saw while performing straight cuts. This depends primarily on how much pressure you can apply on the handle. Capability: 20-inch square tiles with 5/8-inch thickness. Extruded aluminum base for improved stability. Weighs a reasonable 17.2 pounds. Chromed steel rails to help produce smoothness and flow during operations. Ball bearing carriage design reduces rotational friction and load capacity. Reduces overall workload time, thanks to efficient scoring and snapping design. Diagonal cutting will require some effort. This is because the guide is lax in detailing the process. All you need do is get the score over the cutter’s center and then snap the tile. No matter how well you tighten the knob, the guide/fence does not remain fixed in position. One of the most noticeable features on the QEP 10630Q is a titanium-coated tungsten-carbide cutting wheel (7/8 inches), capable of performing durable and smooth scoring on tiles.Porcelain as well as ceramic tiles can be rip-cut using this rather sturdy and sought-after model. You are looking at 24-inch regular cuts and 16-inch diagonal cuts with this piece. You can simply resort to compressed air or soap water to clean the ensemble without fussing over specialized cleaning fluids. You can align your tiles to optimum accuracy using the adjustable straight edge measurement guide on the main cutting bed. A pair of chrome-plated steel rails bring ruggedness and stability to your tile cutting endeavors. Also, smooth scoring is more than a possibility, thanks to the linear ball-bearing slides incorporated into the QEP 10630Q’s design. The bicycle grip handle bar is ergonomic and designed for fatigue-reduction over prolonged stretches of time. It is averagely weighted, specifically 18.2 pounds. Capability: 24-inch regular cuts and 16-inch diagonal cuts. Handles porcelain, glass, as well as ceramic tiles. Weighs in at 18.2 pounds. Titanium-coated tungsten-carbide cutting wheel (7/8 inches). Not recommended for off-center cutting tasks. Does not cut-snap well with tiles that have textured surfaces. We are aware that we ended up playing favorites and putting a QEP brand model in both our No-1 and No-2 spots. This is intentional, because we have personally found no other tile cutters out there that bring value for money and outstanding performance quite like these two. With the QEP 10900Q, you still get features that are popular with most QEP brands. These include: a titanium-coated tungsten-carbide cutting wheel (7/8-inch); an adjustable straight edge measurement guide; chrome-plated steel rails; a rubber-padded aluminum alloy base; and linear ball bearing slides. All these features promote stability, accuracy, smoothness, and workload-reduction. When it comes to rip-cutting ceramic and porcelain tiles, you can perform regular 35-inch cuts and 24-inch diagonal cuts. This is a marked improvement compared to what other brands bring to the table. The bicycle grip design on the handle ensures ergonomic stress-free work for long time periods. It is reasonably weighted, specifically 23.3 pounds. Capability: 35-inch regular cuts and 24-inch diagonal cuts. Weighs in at 23.3 pounds. Strong sturdy base and frame. Ergonomic handle for less fatigue during operations. Smooth rail and slide design to improve speed and precision. Diagonal cuts have proven tricky without breakage; a wet saw produces better results in this regard. Has displayed troubleshooting issues with porcelain. This is a rather specific field of power-tool shopping, one where you will need to have a keen understanding of technical savvy, as well as experience. Tile cutting is delicate work, and often tags along sizeable risk factors. Here are some of the key points to keep in mind when next you go shopping for the best tile cutters. Large-scale industrial version tile saws are massive and bought in bulk. These are commonly employed in manufacturing where they cut and shape tiles for distribution and retail. Tile cutting, on the other hand, is best applied to hobbies or private business contracts. The latter is what we are detailing here, power tools that can be used in garages and workshop dens. Whichever one you opt for, there are a handful of key points to bear in mind.The cutting wheel needs to be in peak condition, or you are wasting your time first and your money second. Tile cutting is all about precise incisions, and the cutting wheel is directly responsible for accuracy. By gradually turning the blade, you can ‘feel’ for irregularities (lumps, discontinuities, perimeter damages, etc.). You will not get cut; the ‘blade’ in question is hazardous only when the device is powered up and running at optimal speed. Also, tile cutters make incisions that enable easy cutting of said tiles, they do not directly cut through the tiles. This is a set of measures and standardized data that is invaluable to professionals who deal with cutting strip tiles for use in skirting boards. This involves LFT or Large Format Tiles, and grants you bracket precision values. You can use any type of cutter and still find the Baseboard reference system handy. Always request tests to be performed on your tile cutter based on your material of choice. This will save you loads of time and disappointment. 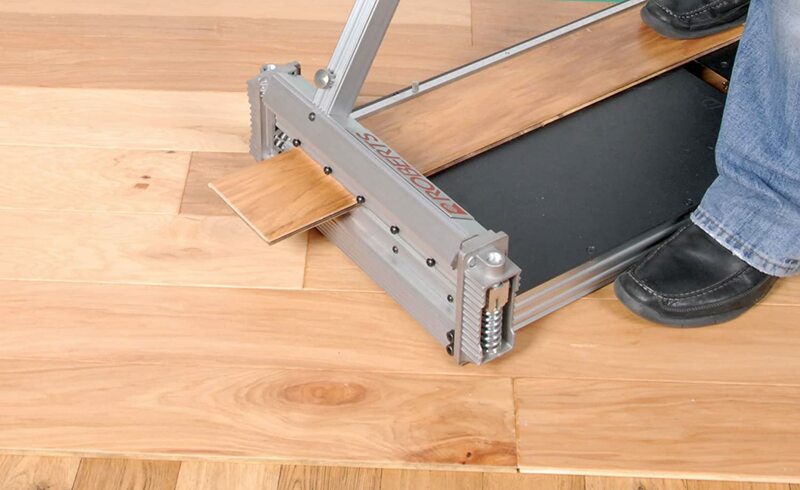 There are DIY tile cutter tests available online. Handheld, Wet, and Table are the three categorical kinds of table cutters available. Handhelds are portable, good for small-scale tasks, and come in cordless and corded varieties. Stone tiles come under this purview too, but you cannot perform deep cuts using handhelds. There are three sub-categories for this cutter type: dry, wet, and models that can handle both. Back to the main branch, wet tile cutters are beginner favorites. The blade demands water to stay cool during operations. Also, this setting restricts the accumulation of dirt and dust. Lastly, table tile cutters produce the smoothest results. They work well with large tiles and multiple tile-tasks. Owing to their comparatively bigger blades, they can cut to greater depths. 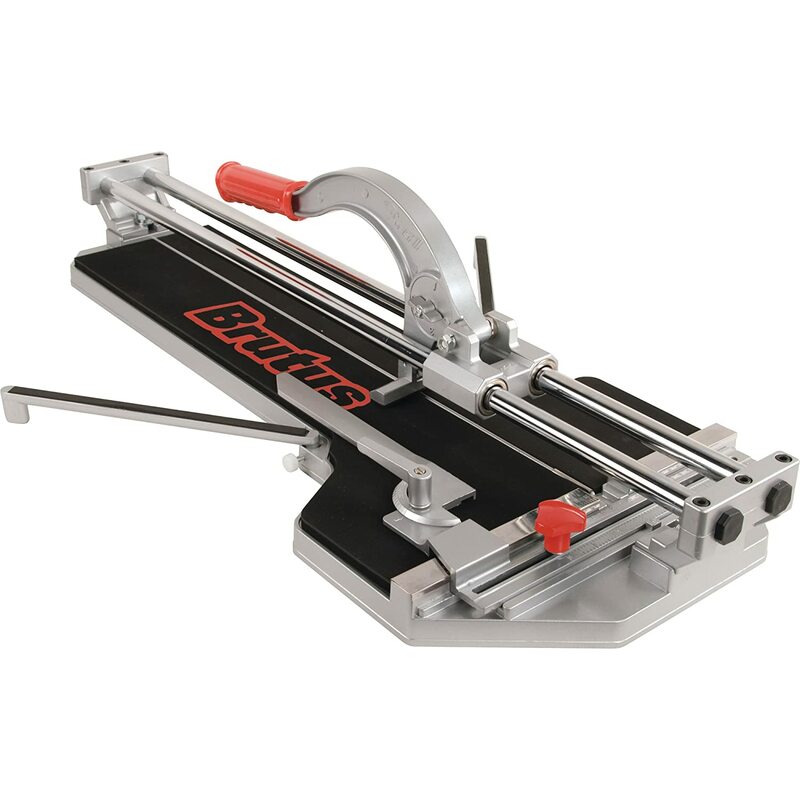 Diamond-edged plates are well and good, but we are detailing the importance and versatility of manual tile cutters. To that end, how does the latter beat the former, especially when it comes to cutting glass tiles and glass mosaics? You can dry-cut without resorting to the use of electricity or water; manual cuts 90% faster than diamond-edge; the finish is as clean as it is bright; you do not need to buy, maintain, and keep at hand a wet saw; and it is stunningly cheaper. 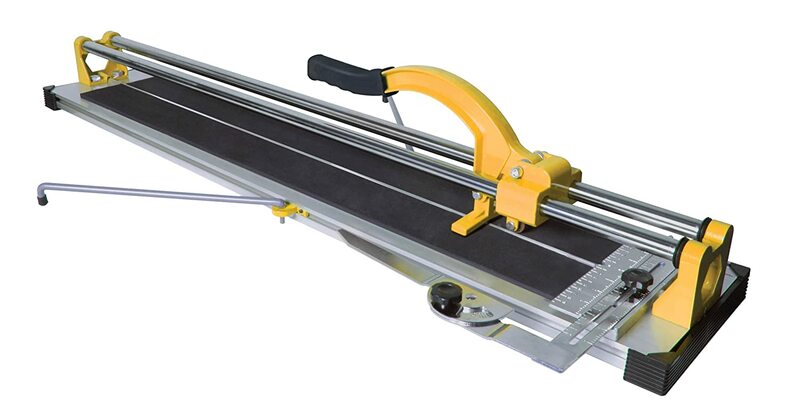 From an aesthetic end result to affordability, manual tile cutters are superior to diamond-edge tile cutters, especially where glass cutting work is involved. Also called snap or rail cutters, a manual tile cutter is ideal for bathroom tiles and window ledges; except stone tiles. If you demand more precise cuts, get a piece with chrome-plated steel rails. For heavy and large tiles, opt for handheld wet tile cutters; these are great for both kitchen and bathroom tile work, except stone. Sacrificing accuracy for large-scale work are table tile cutters. They are the biggest in the market today and will require plenty of assembling. Lasers and light guided features are present to compensate for the reduction in precision, as compared to the other tile cutter types mentioned above. 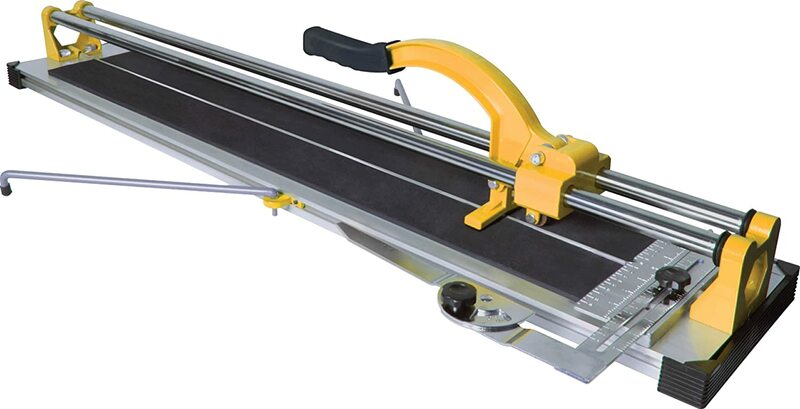 In recommending our final winner, we are going to take a step back and go with No-2 on the list, namely the QEP 10630Q 24-Inch Manual Tile Cutter. This is primarily because it is a precedent model for our No-1 choice (the QEP 10900Q). However, it has not garnered the same ‘mixed reviews’ as its successor. In fact, it handles porcelain much better than the ‘newer tile cutter’, and it shares all the most important features present in the ‘fresh’ model. From its solid construction to an eye for stability and precision, the QEP 10630Qis easy to assemble right out the box. Even when dealing with adjustments, it does not feel like rocket science. Of course, you will need to understand the basics of handling such a high-end tile cutter. Other than that, there have been plenty of reports of amateurs quickly getting the hang of things and finishing quite the workload in a short time period using the 10630Q. You will almost never run out of room while working on your tile cutting tasks. This is mainly thanks to the table extender incorporated into the cutter’s main frame design. While its successor handles a slightly bigger tile-range of 35-inch regular cuts and 24-inch diagonals, the 10630Qcomes ready to cut and snap 24-inch tiles and 16-inch diagonals, which is not all that big a difference, especially considering that the average bathroom, workshop, or kitchen does not use large format tiles anyway.